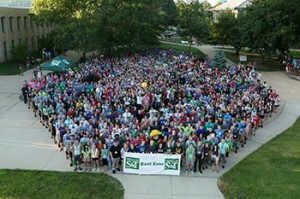 Incoming freshmen at Missouri S&T’s 2015 Opening Week Picnic. For the third year in a row, Missouri University of Science and Technology expects to break its all-time record enrollment when classes start on Monday, Aug. 24. Missouri S&T officials estimate the total fall enrollment will be about 8,900, which would break the record of 8,642 set in 2014. The number of new, first-time freshmen is expected to be 1,491, an increase of 200 over the 1,291 enrolled last fall. This will also be the largest freshman class in Missouri S&T’s history, slightly above the 1,488 enrollment set in 1981, more than 30 years ago. Many of Missouri S&T’s incoming freshmen are Missouri natives, but 33 states are represented. Eight foreign countries – Bolivia, Canada, China, Germany, Iceland, Italy, Kuwait and Saudi Arabia – are also represented. The quality of this year’s freshman class remains high with the average ACT score at 28.1. This is among the upper 10 percent in the nation. Over 125 of the first-year students were high school valedictorians or salutatorians. Twenty percent are the first in their families to go to college. Missouri S&T was the first choice school for more than 80 percent of our incoming freshmen and 97 percent of them chose S&T because of its academic reputation. Record numbers of women and minority students are also expected when classes begin on Monday, Aug. 24. The official fall enrollment figures will be released after the fourth week of classes.